Calvin Touchet was born on June 7, 1947, to Dulas and Adley Touchet, and in n 1965 he graduated from Maurice High School. 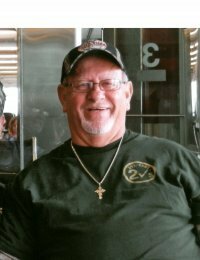 During high school he worked with his father at the family's business, Touchet’s Service Station and Bar which, at that time, was a service station, bar, bulk plant and a barber shop. In 1977, he went to work for Southern Engine as parts manager. In 1986, the Touchets purchased Touchet’s Service Station and Bar from Calvin’s parents. In 1992, Carroll Langlinais and Garland Thompson had the idea to start a regularly scheduled Cajun French music jam session and the Touchets agreed to host the sessions. At first, they began at 8:00 am and finished at noon. Currently, the popular jam sessions begin at 2:00 pm and lasts until all of the musicians have finished playing. The Touchets have been hosting these jam sessions every other Saturday 22 years. Many musicians have launched their careers at Touchet’s Service Station and Bar, and the venue has been honored by several organizations for its promotion of Cajun culture. In 2008, Touchet’s was honored by the Cajun Culture Association for their dedication to preservation of Cajun music and culture. In 2011, it was also honored by the Cajun French Music Association (CFMA) with the Appreciation Award for its promotion of Cajun French music. Touchet’s has supported the Cajun Culture Association for many years and has allowed it to hold its meetings and functions in the quaint location. Calvin and Donna have been members of the Cajun Culture Association since its inception, and Calvin is a current board member. The association annually donates funds to students to study the French language. Calvin and Donna Touchet were married in 1977. They have two sons, Dwayne and Derek Touchet.